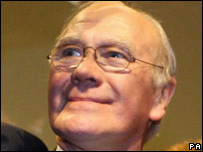 Liberal Democrat leader Sir Menzies Campbell has accused the government of failing to learn lessons from this summer's floods. On a visit to Gloucestershire he said ministers were wrong to replace "locally based" emergency control centres with larger, regional versions. Such moves could lead to "increased risk of devastation", he added. But the government said it was "committed to providing a resilient" system across the country. Parts of England and Wales were hit by severe weather in July, with flooding affecting thousands of homes and leaving many without water. The government plans to replace the control rooms of England's 46 fire brigades with nine regional centres. Sir Menzies visited the TriService unit near Gloucester, which is threatened with closure. He said: "The government is compromising safety and could be putting lives at risk by introducing regional fire and rescue control centres. "Closing down locally based centres will severely undermine a community's ability to cope with emergency situations such as flooding, while regional centres will lack crucial local knowledge." He added: "It is high time that the government realises that a one-size-fits-all approach to fire and rescue centres will not only put public safety at risk but will also stop close co-operation between local fire, ambulance and police services purely because of a Westminster diktat." In relation to construction on flood plains, Sir Menzies said ministers should put people's minds "at rest by giving responsibility for flood defences to one agency who will ensure defences are adequate before any building takes place". He added: "Gordon Brown promised a full review on the floods so that lessons could be learnt, but the government appears to being going full speed ahead on moves which may lead to increased risk of devastation when flooding occurs in the future." But a Department for Communities and Local Government spokesman said: "The government is committed to providing the resilient fire control system that the country needs to meet the challenges of today's world. "That is why we are funding a resilient nationwide network of control centres automatically backing each other up in times of need such as high volumes of calls. He added: "The sheer scale of mobilisation is massive. But this fully networked system will take much of the logistical burden off local commanders and will be able to deploy resources on a national or regional scale - something an individual control room simply isn't equipped to do. "This will enable local commanders to focus on their immediate priority - directing events on the ground."